I have a few things related to technique that I’ll be posting soon, but just for now, here’s something you might try practising that can help with sharpening up your accuracy. It’s all to do with sharpening up that initial explosion into the first note. The exercise takes four sixteenth notes and displaces them by a sixteenth each time. Use alternate picking and, at first, stick to the rule of using a downstroke on a downbeat and the ‘and’, and using an upstroke on the off-beat sixteenths. After you get comfortable with that, reverse the exercise so you’ll start on an upstroke. 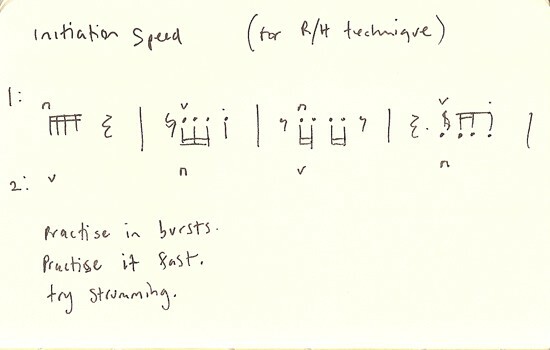 Practise in bursts: play it at one speed a couple of times and then double the tempo. Switch back and forth between the two. Play it fast: There’s a good deal of sense in practising slow first and then working things up to a faster speed gradually, but don’t forget to try it fast, also. I think there are different movement that you can use at different rates. So by trying something really quickly, you’ll be giving your hands/brain/whatever some information that’ll help ‘it’ decide whatever the best motion is to use. A simple example might be when you try to play something really quick you understand that you need to move less, or that you’re moving too much. But there might be other lessons to learn there, too. Think of a horse’s gait: Walk, Trot, Canter, Gallop. All different movements. A walk at the rate of a gallop wouldn’t work. So perhaps there are different movements required when we play at different rates, or in different ways. At any rate, maybe this will make you think about the movements you make when you try to execute things quickly. Try strumming: Try the same exercises, but when you strum, you make a bigger movement. It’s a little bit harder. Try switching between picking and strumming. Practice this in bursts, too. I have many more technique exercises coming soon.